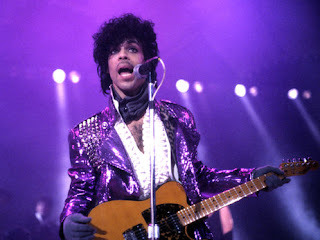 Way back in the 1980s, were you the one playing "When Doves Cry" over and over? Well, don't be surprised if your kids wind up doing the same thing. Young adults have strong positive memories of the music their parents loved when they were the same age, a study finds. That flies in the face of the cultural stereotype that children reject their parents' taste in music. For real? "They would hear this music and say, 'Oh yeah, that's my parents' music,' with obvious fondness," says Carol Lynne Krumhansl, the psychology professor at Cornell University who led the study. The study was published online in the journal Psychological Science. The scientists had been testing musical memory in an earlier study, and were surprised to find that college-age participants could identify older pop and rock songs just as quickly as the new stuff. Even more surprising, they liked the older stuff more. So the researchers decided to try to nail down what was happening, using clips from hits off Billboard lists from 1955 to 2009. More than 60 student volunteers (average age 20) listened to short clips of the top two pop and rock songs for each year. The researchers quizzed them on which songs they recognized, how much they liked them and their emotional responses. They were also asked if they had memories associated with the songs and if those memories were from listening with parents, alone, or with others. 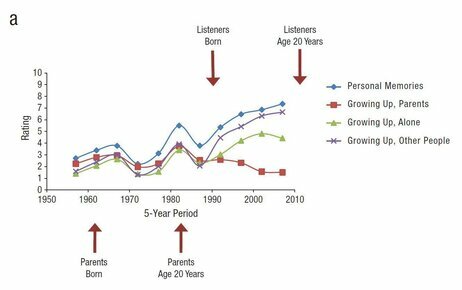 Earlier research has found that the music heard in late adolescence and early adulthood has the most impact and staying power through a person's life. So the researchers figured that today's 20-year-olds would be all about Rihanna and the Black Eyed Peas. Not so. "We didn't have any idea" that young adults had strong personal memories of the music of the early 1980s, Krumhansl told Shots. She and her colleague, Justin Adam Zupnick of the University of California, Santa Cruz, were even more surprised to see the second "reminiscence bump" in emotion and memory for top hits from 1965 to 1969. The connection to parents' music isn't entirely surprising. Music plays a central role in child rearing, both in the songs children are taught at home and in school and in those heard more informally as part of the home environment. The songs parents choose to listen to reflect their taste, their values, their era. Music is a powerful cue for retrieving strong personal memories — when you kissed that girl at summer camp; the blue polka-dot dress you wore to prom; how lonely you were freshman year. And the human brain remembers music with extraordinary detail, unlike spoken words, in which people remember just the gist. After hearing less than a second of a song, people can "come up with the title and the artist," Krumhansl says. "They know the emotional content. They know the style." The 1960s music may evoke strong memories in 20-somethings because of the quality, Krumhansl speculates. We are talking about The Beatles here. But the top pop songs of that era used in the study also included "The Ballad of the Green Berets," "To Sir with Love" and "Sugar Sugar," so maybe it's not just that. Next, Krumhansl wants to find out if other generations have the same experiences with emotional memory and music, and try to trace influences back through multiple generations. She's launching a Web-based survey that covers 100 years of pop hits, and welcomes public participation; check it out here. And maybe play "Bette Davis Eyes" (No. 1 hit, 1981) while you do.